In the spirit of last week's Fort Bragg announcement, we present a few other interesting ways Californians have gone about saving water. Last week, city officials in the tiny California coastal town of Fort Bragg ordered restaurants to start using disposable plates, cutlery, and cups. Their logic: Cutting out re-usable dining sets reduces the need for dishwashing, which in turn saves water. 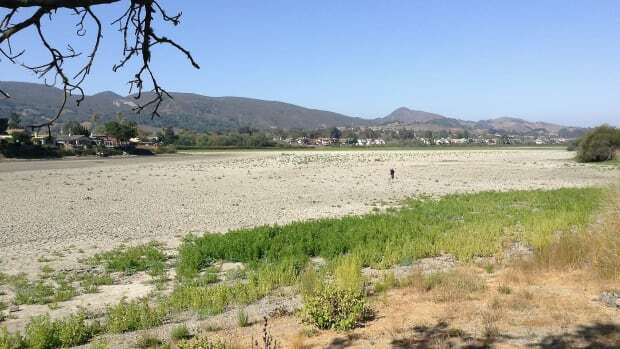 This directive comes at a particularly dire time: Due to the drought, the Noyo River, which supplies the city&apos;s drinking water, is no longer able to push back against seawater from the Pacific that flows into the river during high tide. As a result, ocean water is seeping into the city&apos;s municipal pipes. Without the Noyo River as its main source of drinking water, Fort Bragg is left to rely on two springs for its entire water supply: the Newman Gulch and Waterfall Gulch, which, combined, only supply about 400,000 gallons of water a day. The waters of the Noyo, on the other hand, were at one point able to supply 300 to 400 gallons per minute. This dish-free mandate has caused quite a stir among Fort Bragg restaurants. Due to the backlash, those dining restrictions could be eased by next week&apos;s city council meeting. "You might be able to cut a filet mignon with a plastic knife, but you are not going to cut a New York," Jim Hurt, co-owner of Silvers at the Wharf and Point Noyo Restaurant and Bar, told the San Francisco Chronicle. "The expense is going to be horrendous, I would expect. So that&apos;s going to be a major impact. It seems to me there are other ways to save water." 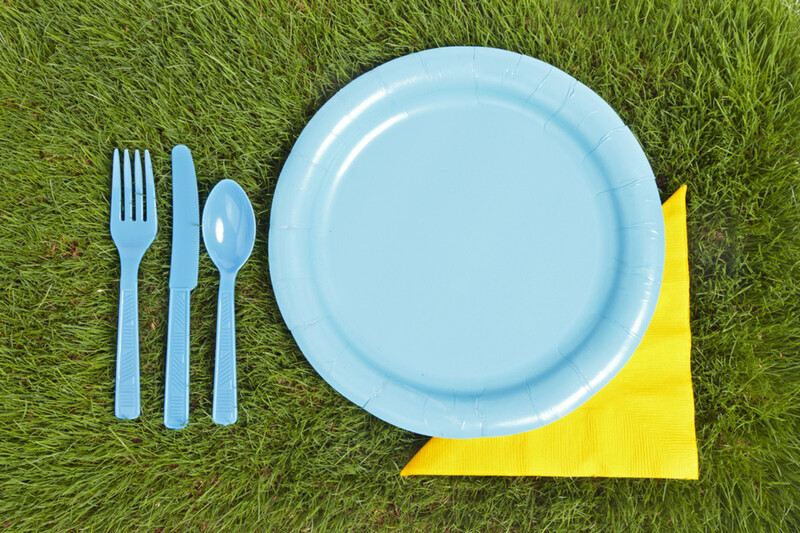 Enjoying a $30 steak from a paper plate may seem decidedly lowbrow to some, but eliminating dishes from restaurants arguably makes a lot of sense, at least from a water conservation standpoint. In the United States, hospitality and food service accounts for about 15 percent of all the water used for commercial and institutional purposes. A single restaurant can use up to 5,800 gallons of water a day. As we&apos;ve reported before, research suggests that lush, verdant lawns imply a household&apos;s higher social status, including stronger perceptions of sexual attractiveness, family orientation, and religiosity. Megadrought be damned, some homeowners are less likely to swap out precious sod for succulents and other less water-intensive landscaping. As lawns continue to wither, and Governor Jerry Brown&apos;s statewide water restrictions remain firmly in place, lawn painting—quite literally, the process of spraying a lawn with green dye—has proliferated across California. "The fad for trompe l&apos;oeil gardening has been a boon for lawn-painters such as David Bartlett, the owner of Xtreme Green Grass, whose business has grown 75 percent this year," the Economist reports. "Over the same period Jim Power, who runs a lawn-paint supply company called LawnLift, has seen sales triple. 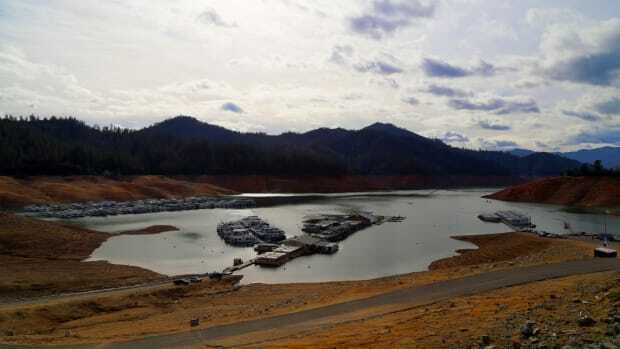 &apos;It has become more socially acceptable to paint your lawn ... especially as it&apos;s become more socially shameful to water it.&apos;"
J. Wesley Judd&apos;s rundown on recycled wastewater describes how the "toilet to tap" movement may be California&apos;s next best option for combating drought. Though irrigation for lawns, golf courses, and parks is currently the most common use for re-claimed water, recycled wastewater could help fight fires, replenish depleted natural wetlands, and even save farms from going under. Eventually, Californians could expect to be drinking recycled effluent too: In April, Los Angeles Mayor Eric Garcetti vowed to "expand recycled water production by at least six million gallons per day" by 2017, and to "expand recycled [drinking] water production, treatment, and distribution" as part of the city&apos;s first sustainability plan. The plan is not altogether outrageous; Orange County has already been recycling its wastewater into drinking water for several years. Despite the yuck factor, recycled wastewater is also much more viable than desalination. The process yields more water, uses less power, and prevents discharge back into ocean. And, lest we forget, we&apos;ve all probably consumed treated wastewater in some form—virtually all drinking water loops through use and re-use. Not so gross anymore, huh? Traditional Native American land management practices could ameliorate the effects of drought, and prevent wildfire from spreading. As Al Jazeera reports, tribe members, scientists, and U.S. Forest Service officials are increasingly joining forces to introduce Native forest stewardship back into state lands. 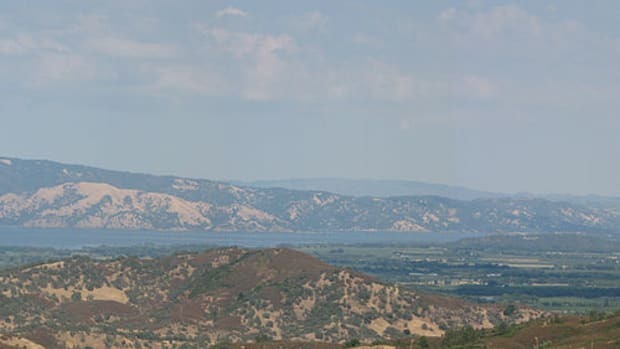 "Across California, the area&apos;s first people are reclaiming their roles as expert stewards of the state&apos;s land and water resources," Lisa Micheli, executive director of the Pepperwood Preserve in Sonoma County told Al Jaazera. "As drought and fire ravage under-managed and overgrown public and private lands, partnerships like this are reintegrating native knowledge." Thinning out forest canopies, for instance, helps ensure that rain and snow reaches the ground and seeps into the watershed. Restored meadows also act as natural sponges, absorbing water that not only attracts wildlife back into an area, but slows the spread of wildfire. Let&apos;s raise a glass of recycled toilet water to that. 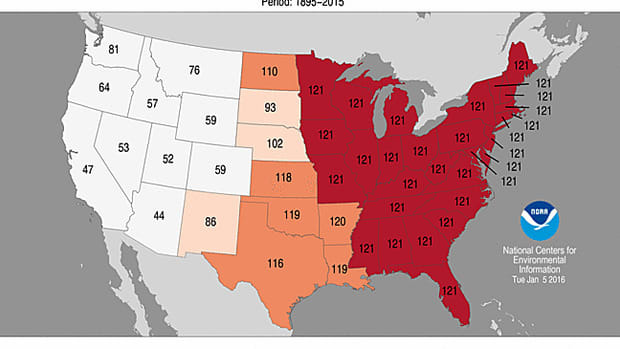 In 2015, every state in the country was warmer than the 20th-century average.